What’s the UK Space Incubator Network? The UK Space Incubator Network is comprised of a growing number of incubators dedicated to identifying and accelerating the growth of start-up and scale-ups that are leveraging space technology as a critical asset in their businesses. Dock, in Leicester, offers office, light commercial and laboratory space specifically for high tech companies and includes companies that work with technology within the space sector. The Dock will provide a regional incubator for start-up space companies which will have access to a range of business support. 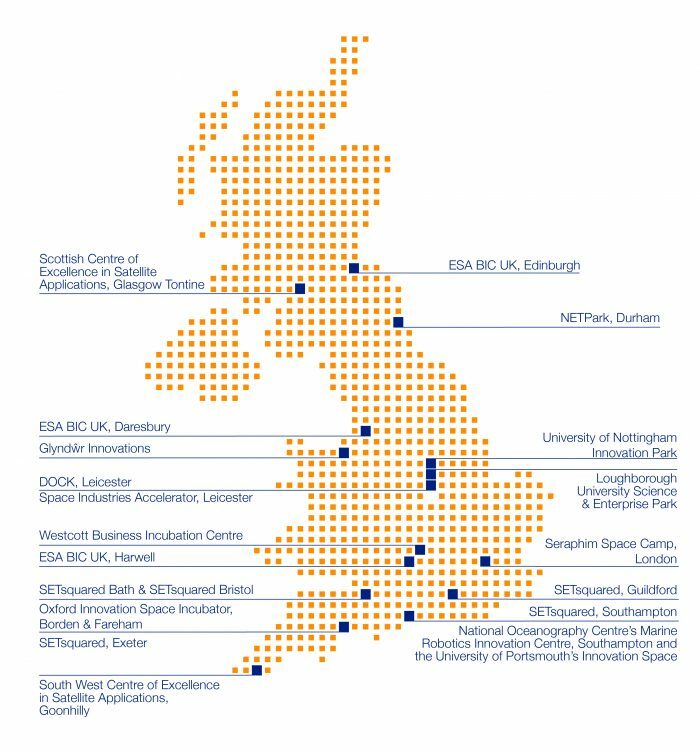 The European Space Agency Business Incubation Centre United Kingdom (ESA BIC UK) is managed by the Science & Technology Facilities Council (STFC) and supports early-stage space-related companies. Their goals may be either commercialising technologies developed for space in non-space applications or developing technologies for use in space. We offer a package of technical support, access to specialist facilities and equipment, business support, grant funding to accelerate product development, networking events and office accommodation. As the UK branch of the Europe-wide ESA BIC network we can support 12 new companies per year for an incubation period of 1-2 years, across our three locations at Harwell Campus, Sci-Tech Daresbury and the Royal Observatory, Edinburgh. Glyndŵr Innovations (GI) manages the OpTIC Technology Centre which provides technology-related, innovative companies with accommodation and business/academic/financial support. Glyndwr Innovations is a leading provider of innovative product development engineering and technology consulting. A hub for high-level opto-electronics technology and scientific innovation, the site comprises research and design, business incubation units and conferencing. Its vision is to ensure a high quality, consistent supply chain for the space sector from north Wales. Loughborough University Space Incubator offers bespoke support to start-up companies and SMEs new to the space sector. The Space Incubator assists businesses across both the “upstream” and “downstream” sectors (e.g. applications using satellite-data). From an initial meeting with an advisor to review your business ambitions and needs, we will help guide you to appropriate local and national sources of expertise and funding, and facilitate access to Loughborough University’s world class science and engineering knowledge-base. Your business will become part of the Space Cluster and may be offered affordable accommodation in our Advanced Technology Innovation Centre (ATIC) and enjoy campus partner benefits. 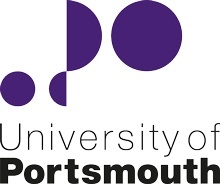 The National Oceanography Centre’s Marine Robotics Innovation Centre and the University of Portsmouth’s Innovation Space, supported by the South Coast Centre for Satellite Applications, will provide an innovation hub in Southampton with world-leading expertise in developing next generation Marine Autonomous Systems and an incubation centre in Portsmouth. As part of County Durham’s innovation strategy, Business Durham seeks to help existing businesses diversify and innovate; encouraging high-tech, high growth businesses to join the growing cluster within County Durham. At the centre of this strategy is the North East Technology Park (NETPark). NETPark houses the NE satellite applications Centre of Excellence. NETPark provides a dynamic and supportive environment to accelerate the growth of ambitious, innovative, high tech companies into global markets. NETPark encourages collaborative multidisciplinary links, driving innovation, enterprise and economic prosperity. OI Space Incubator is for innovation projects involving Downstream Space solutions. Ideal candidates are either established businesses wanting to extend their propositions to involve satellite applications or new high tech start-ups. There are two ways to apply: a response to an Ordnance Survey innovation challenge to develop solutions that utilise the Android raw GNSS signals or a project that incorporates any downstream space solution. We will select 10 winning projects from anywhere in the country and provide each of them a bespoke package of support based in two of our Hampshire centres to incubate and launch their project. The Westcott BIC provides specialised business and technical support for early stage businesses in the areas of rocket propulsion, 5G communications, drones and autonomous systems. Space Camp is the UK’s first dedicated SpaceTech accelerator, being backed by Seraphim Capital the world’s only Venture Capital Fund specializing exclusively in SpaceTech investment. Space Camp is supported by both the UK and European Space Agencies and Satellite Application Catapult. Space Corporates, Data Analytics, IP Experts and Specialist Investors have already committed to contribute to the programme syllabus – including existing Seraphim Space investors such as Airbus, SES, and Surrey Satellite Technology, and key corporates. The Space Camp value proposition is designed to offer valuable SpaceTech corporate exposure to the ‘best of breed’ high growth technology companies globally, giving them access to capital, support on building investor relations and customers to build significant value. The Scottish Space Incubator, run in partnership between The Scottish Centre of Excellence in Satellite Applications (SoXSA) and Tontine Glasgow is targeted at space companies with large growth potential. The incubator, supported by a UK Space Agency grant, will support six companies for an incubation period of one year. Throughout the incubation period, the companies will benefit from superb accommodation, unparalleled business support and access to a wide business network through SoXSA. We are looking for both start-up companies and those that want to take their business to the next level. The South West Satellite Applications Centre of Excellence will be based at Goonhilly Earth Station with the University of Exeter as the lead delivery partner. The centre partnership includes GES Ltd, the Met Office, Plymouth University, Falmouth University, PML, and Rothamsted Research, and has extensive commercial partner backing. The Partnership is running a programme of: Wide engagement of existing business/innovation networks in the target markets, to transfer knowledge and to develop new satellite application concepts. Industry-led thematic engagements to focus researchers, business, communities and investors around specific satellite application opportunities. Led by the University of Leicester through the Leicester innovation Hub, participants that successfully make it onto the accelerator programme will be guided on all aspects of launching a business from feasibility and finance, planning and prototype testing, copyright issues and company law through to marketing and public relations, sales strategies and tactics for maximising future growth. The Space TEC programme based in UNIP’s Ingenuity Centre offers start-ups entering the Space Sector a unique environment in which to grow their business. Based in an inspiring building on a vibrant innovation campus, the Space TEC programme offers an opportunity to join UNIP’s existing community of 115 technology-driven businesses and co-located world-leading research facilities and talent. The Space TEC programme is designed to assist entrepreneurs in achieving their goals by enabling access free co-working space for 6 months, access to a package of support, and mentoring opportunities. How has the network developed?